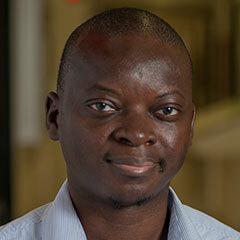 Dr. Awotunde is an Associate Professor in the Petroleum Engineering Department at KFUPM. Since joining KFUPM in 2010, he has taught undergraduate and graduate courses in Reservoir Simulation, Flow in Porous Media, Reservoir Description, and Well Test Analysis. He has also taught the graduate course in Mathematical Methods in Petroleum Engineering. Ph.D., Petroleum Engineering, Stanford University, USA, 2010. M.S., Petroleum Engineering, KFUPM, KSA, 2006. Awotunde, A. A. 2017. GLOCAL: A Global-Local Optimization Template for Multiple History-Matched Reservoir Parameters, JPSE, 154: 1-18. Khan, R. A., and Awotunde, A. A. 2016. Optimal Parameters Selection for SAGD and VAPEX Processes, J. of Petrol Explor Prod Tech., 1-22. Rammay, M. H., and Awotunde, A. A. 2016. Stochastic Optimization of Hydraulic Fracture and Horizontal Well Parameters in Shale Gas Reservoirs, J. of Nat. Gas Sci. and Engr., 13(3): 71-78. Zhang, X. and Awotunde, A. A. 2016. Improvement of Levenberg-Marquardt Algorithm during History Fitting for Reservoir Simulation, Petroleum Exploration, and Development, 43(5): 876-885. Mehmood, S. and Awotunde, A. A. 2016. Sensitivity-based Upscaling for History Matching of Reservoir Models, Petroleum Science, 13(3): 517-531. Zaza, A., Awotunde, A. A., Fairag, F. A. and Al-Mouhamed, M. A. 2016. A CUDA based Parallel Reservoir Simulator, Computer Physics Communications, 206(2016): 2-16. Awotunde, A. A., Ghanam, R. A., Al-Homidan S. and Tatar, N. M. 2016. Numerical Schemes for Anomalous Diffusion of Single-Phase Fluids in Porous Media, CNSNS, 39: 381-395. Awotunde, A. A. 2016. Generalized Field-Development Optimization with Well-Control Zonation, Comput Geosci, 20: 213-230. Awotunde, A. A., Ghanam, R. A. and Tatar, N. M. 2015. Artificial boundary condition for a modified fractional diffusion problem, Boundary Value Prob, 2015:20. Awotunde, A. A. 2015. Estimation of Well Test Parameters Using Global Optimization Techniques, JPSE, 125: 269-277. Sibaweihi, N., Awotunde, A. A., Sultan, A. S. and Al-Yousef, H. Y. 2015. Sensitivity Studies and Stochastic Optimization of CO2-Foam Flooding, Comput Geosci, 19(1): 31-47.